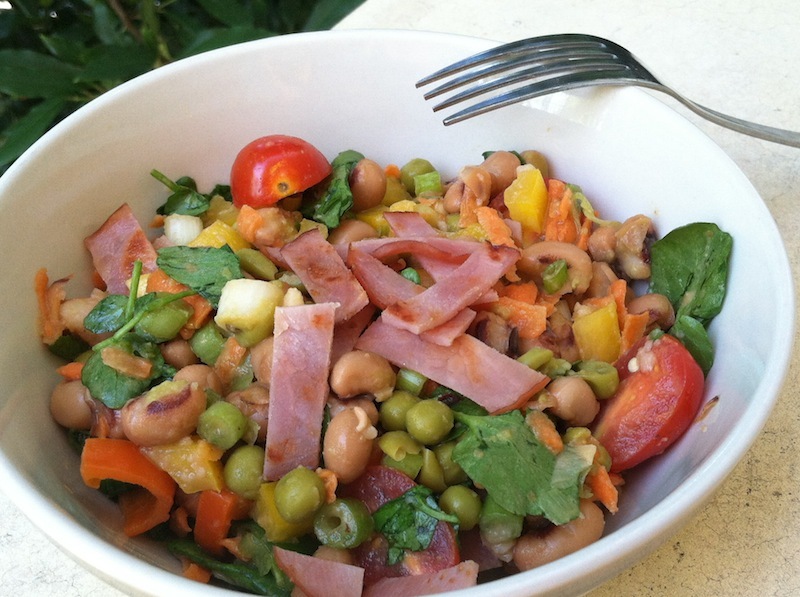 Black-Eyed Pea and Canadian Bacon Salad | Keep It Up, David! Before we get to the black-eyed peas, though, let’s address the other titular ingredient: bacon! 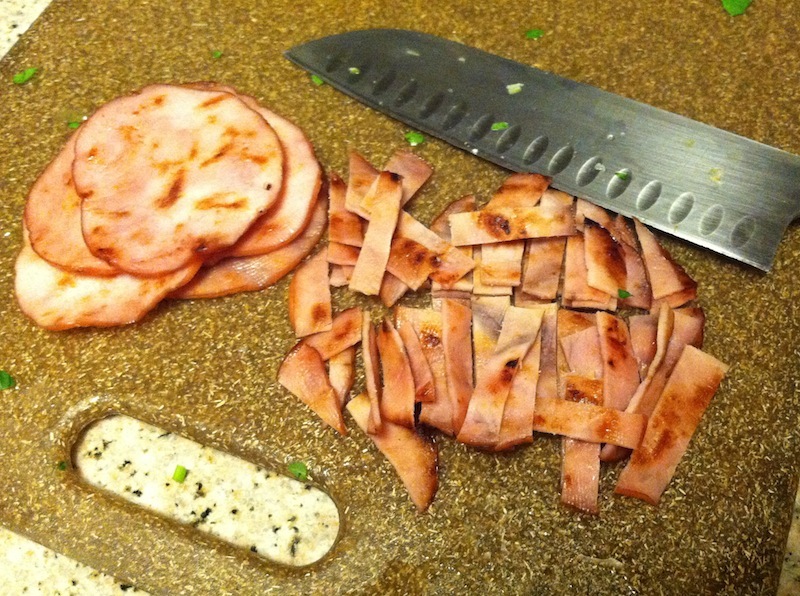 Canadian bacon, to be exact. 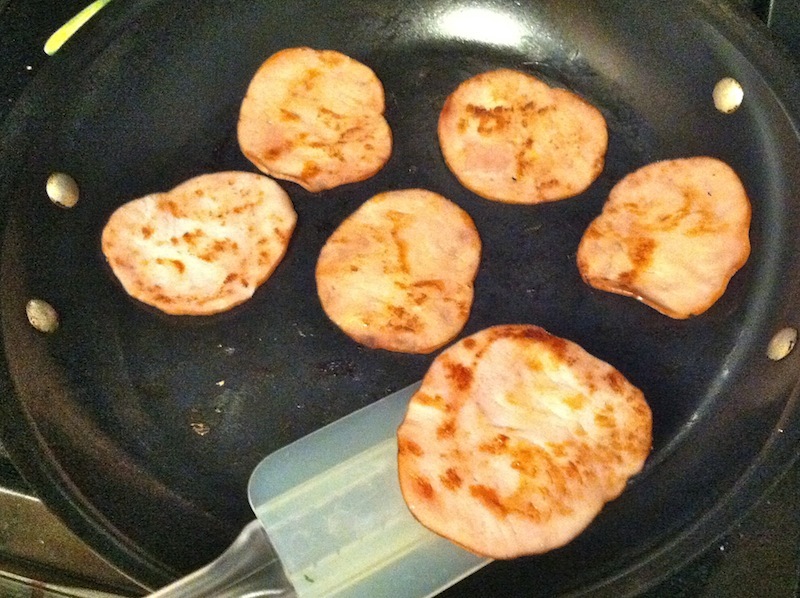 Canadian bacon should be your healthy-eating go-to breakfast meat. It’s low in fat and calories, although, like many packaged meats, it isn’t low sodium (more on sodium later). I bought a 5-ounce package (10 slices), and seared each slice for a couple minutes on each side in a skillet coated with Pam. I just wanted to get a little color on them. 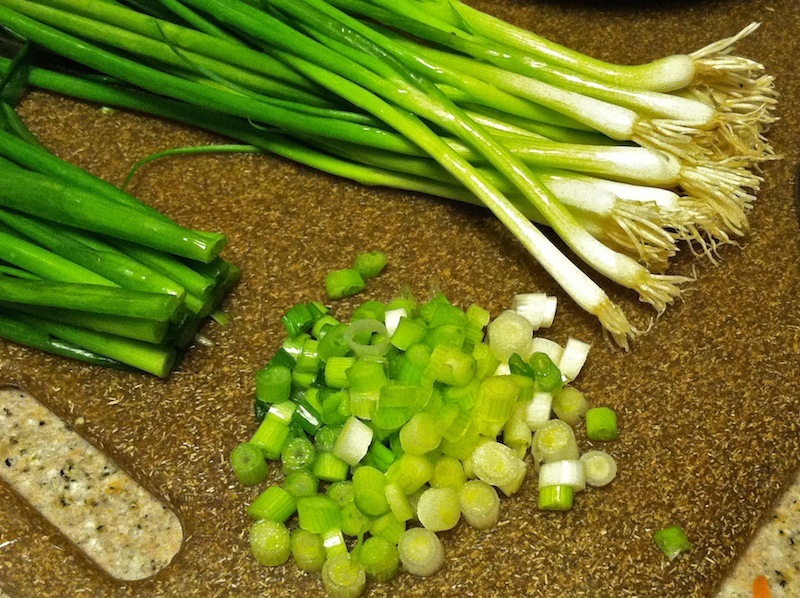 Finally, I took a bunch of watercress, washed it, and separated the leaves from the stalks. 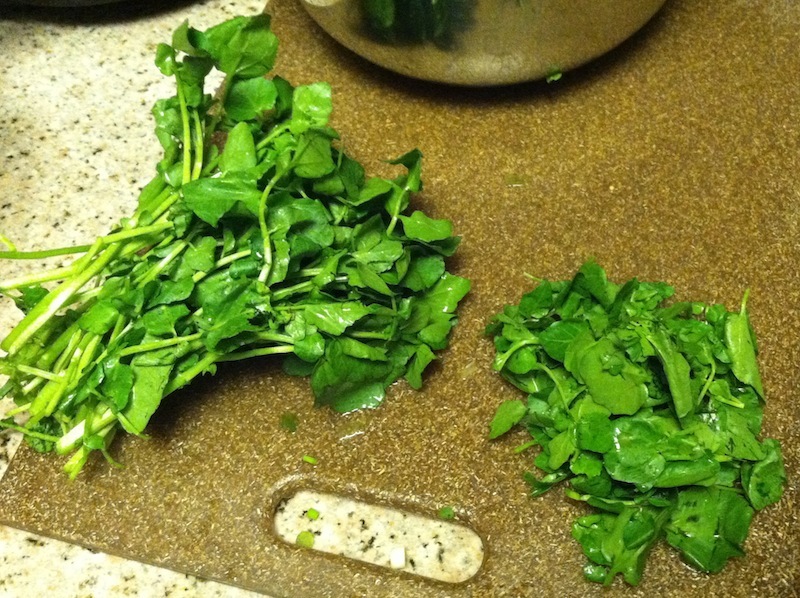 This took a while, and if you don’t have the patience, you can rough chop a handful or two of spinach or arugula. Watercress is a lettuce with a kick – it’s kinda spicy, like a radish. I like it. And that’s your salad, ladies and gentlemen! For a quick, light dressing, I whisked together equal parts dijon mustard, honey, and red wine vinegar – maybe 3 tablespoons of each. I prefer my salads barely coated with dressing, but if you prefer a more thorough soaking, then go ahead and make more dressing – it’s oil-free, and that’s a good thing! Ready for the finished product? Check this out! It’s fantastic. Colorful, lots of flavors, and a little bit smoky, thanks to the Canadian bacon. I enjoyed the black-eyed peas, although I’m sure if you blindfolded me I wouldn’t be able to tell them apart from other beans. One of the other guests at the BBQ said that black-eyed peas are supposed to bring luck, and who couldn’t use a little extra luck on their side? 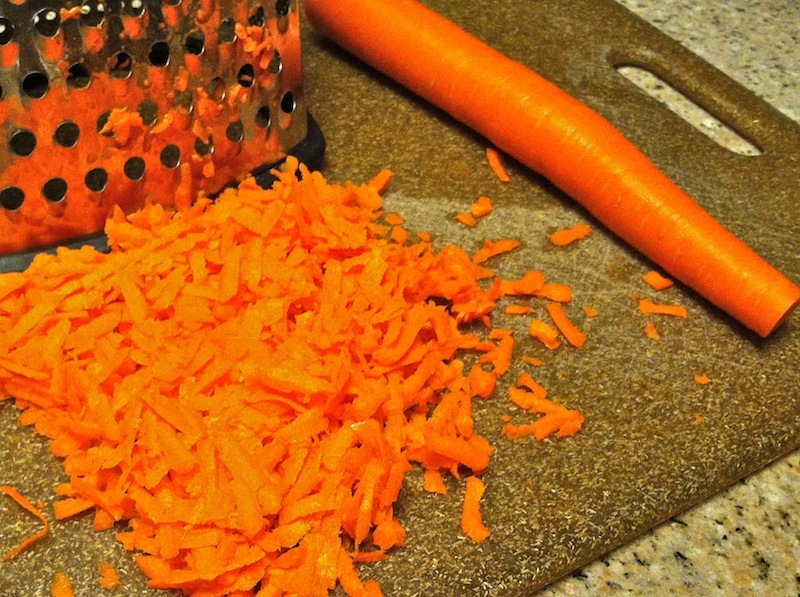 Careful, though, before you go eating piles of this salad – it can be high in sodium. 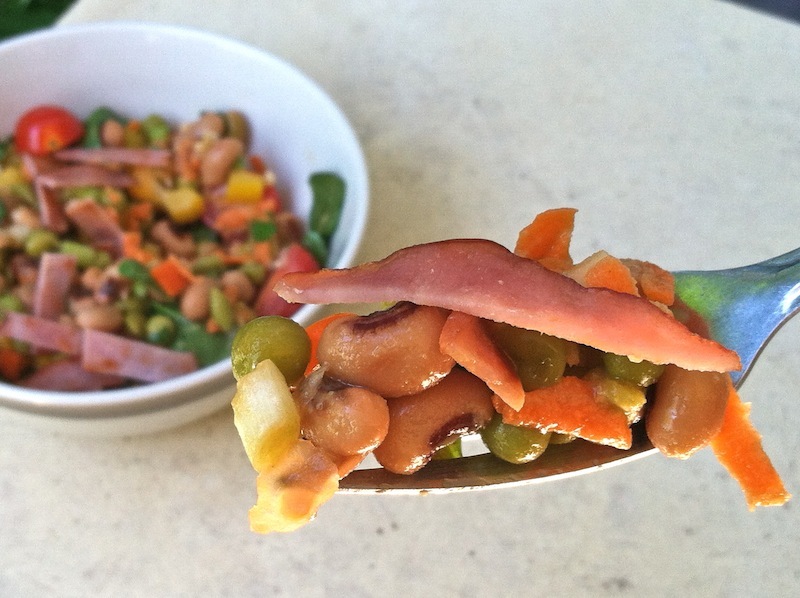 One serving of Canadian Bacon + one serving of black-eyed peas + one serving of canned peas = about half of your sodium for the day. 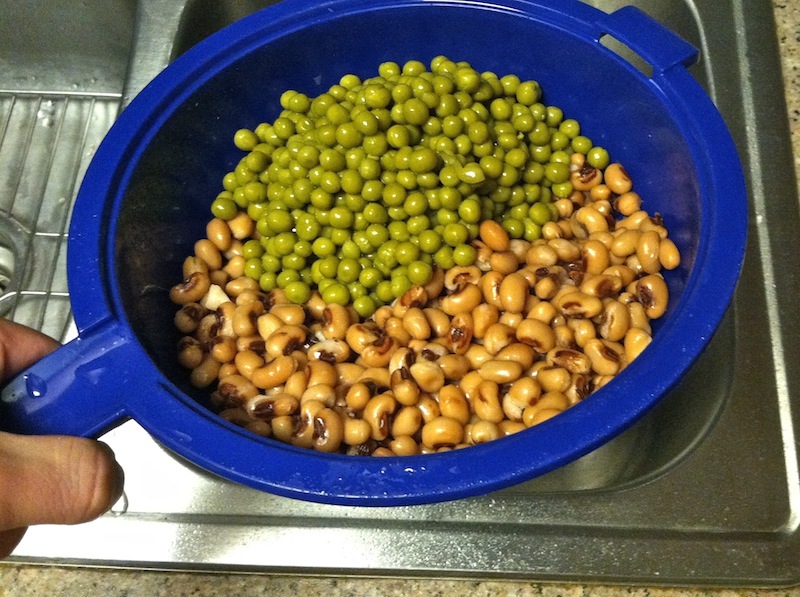 Granted, I rinsed the peas and black-eyed peas, which hopefully washed off some of the added salt, and a serving of salad probably doesn’t contain full servings of any of those ingredients anyway, but still. 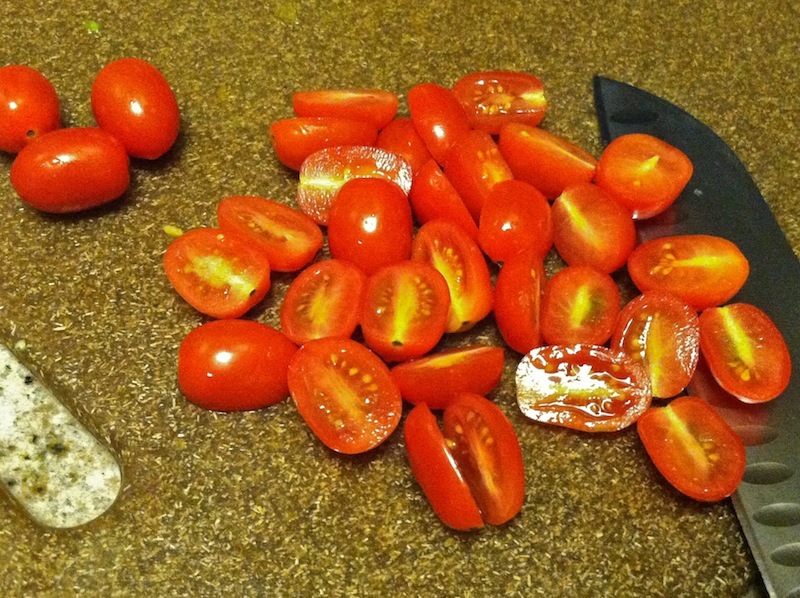 The salt can add up, even in an unlikely dish like a salad! PS – This recipe is based on a similar recipe I found here, but like I always do, I modified it and swapped and added ingredients. 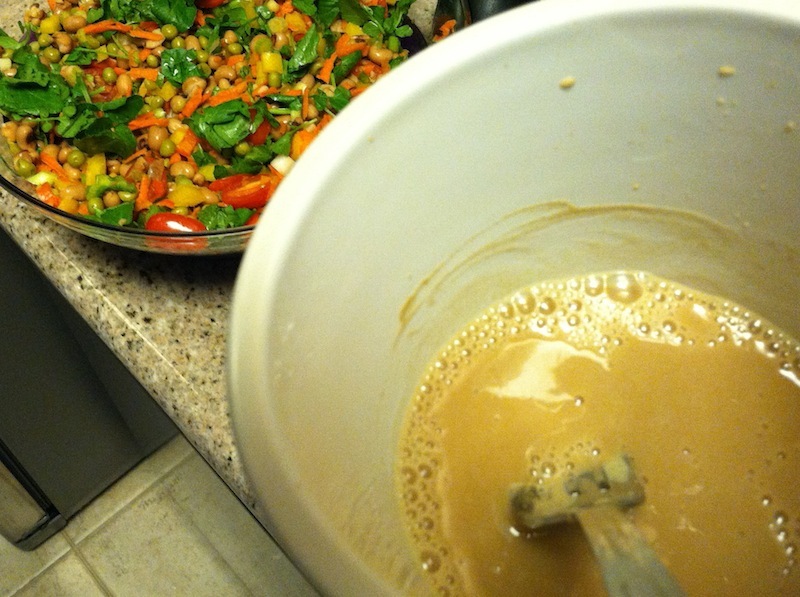 PPS – Want more salad recipes? There’s lots of them on my Recipes page – and I’ll have another new one next week! This entry was posted on Wednesday, October 23rd, 2013 at 12:03 am and is filed under Uncategorized. You can follow any responses to this entry through the RSS 2.0 feed. You can leave a response, or trackback from your own site. I grew up with black eyed peas being a staple food. Of course my mom was a poor kid from Oklahoma, so that explained it. 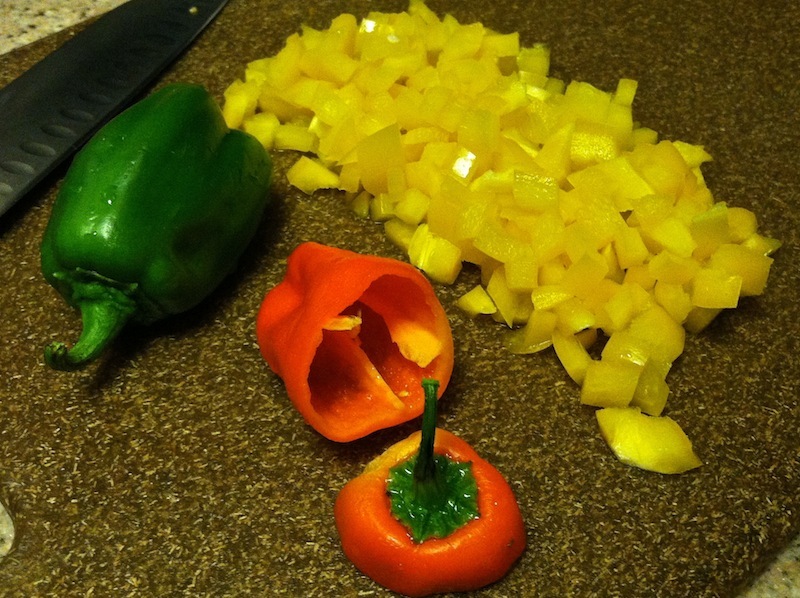 Your recipe looks much more delicious than the way we had it at home…boiled and sprinkled with pepper. Boiled and peppered doesn’t sound that terrible… although I suppose it might get tiresome if you have it all the time!